Wednesdays mornings in 2018; June 13th July 4th & 18th and Aug 1st from 10am – noon. Urban growing at its very best. 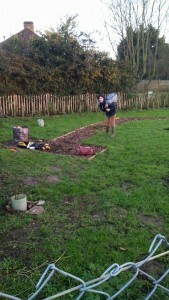 The Whyke Community Orchard was no more than a disused pocket of brambles and fly-tipped rubbish when volunteers turned up in September 2013. 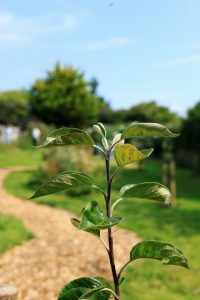 Now the site has a 17 fruit trees, including rare Sussex variety apples, and grafted cherries, a beautiful winding woodchip path and natural hedging along one side of the plot for protection. By car: Whyke Community Orchard is off Exton Road in Whyke; please park on Exton Road. PO19 8BA. There is housing in front of the orchard at Shone Court, with a new postcode PO19 8FT. Disabled access is from Shone Court. Walking access from the Whyke Estate is between 68 and 70 Exton Road, Whyke, Chichester PO19 8BA. Walk between the houses and the substation and take a right towards the orchard onto the footpath, going alongside the High School fence, about 50m north. Coming from Kingsham Road/ Kingsham Avenue; look for the footpath sign heading south off Kingsham Avenue/ Kingsham Road junction opposite the railings. The purple sign for the Coop Funeral service shop across the Kingsham Rd is another local landmark. Take this footpath, or twitten, and walk towards the bypass traffic noise. You’ll be following the eastern boundary of the High School which leads south to the A27 bypass. The orchard is about 150m straight along the twitten on the left, not the first cultivated area, nor the left turning to Bramber Rd, but the second fenced space on the left. You’ll know you’ve arrived when you see the winding path between the trees. If using a car and parking as close as possible on Shone Court, there is a low barrier fence between car park and gate for orchard. 50m from parking to gate onto orchard. Orchard surfaces are a woodchip path and mown grass. There are wooden lips to the path and underneath the gate which might feel greasy. Wild areas grow briar roses, nettles, and burdocks and other thorny species so wear protective clothing ie trousers and boots.